I left Vancouver some days ago via Stanley Park northwest of the city and headed north to see something of Canada before going south. The campsites are beautiful, primitive and horribly expensive. There are campgrounds belonging to Provincial Parks, with pit toilets and just free spaces in the wood, no shower. And bearproof garbage cans with lid. These sites are about 11 to 21 $ per party (unfortunately, one person is a party as well...). 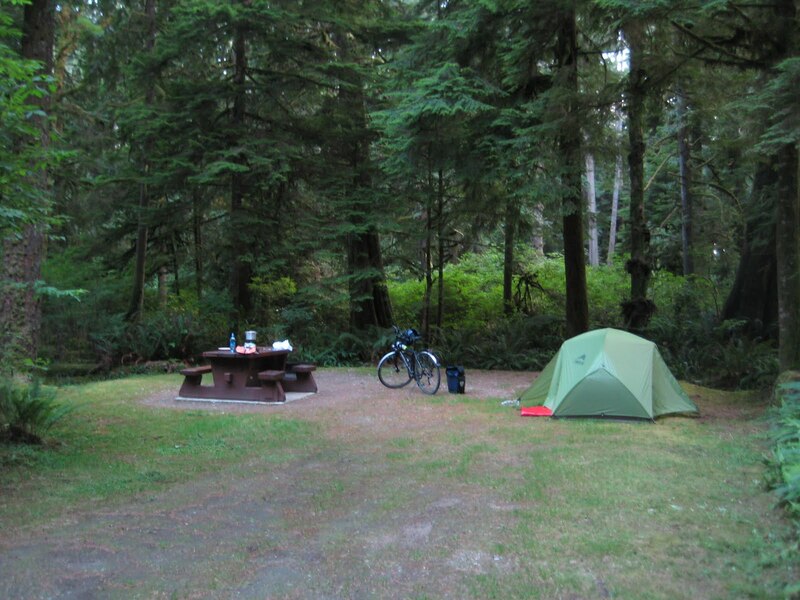 Today I'm on one of many 'private' campsites, near Comox on Vancouver Island) for only 23 $, and they have showers (of course not included). In terms of camp site prices, I can't wait to reach the US - people say, it's better there. But regardless of these conditions, I met two friendly canadian women on the forest campsite yesterday who invited me to their fire. And that was only one of several encounters with friendly people. Not too many cyclists though. Cycling is challenging as it goes up and down steep hills. They are not very long, but steeper than the winding roads in Norway, they just go straigt up. And down again. And up, and down, and so on. But it's ok, the occasional views through the trees are amazing. Andrea, das ist ja supergeil! Bis auf die Preise vielleicht... Will auch am Feuer sitzen! Kenne diese Art Campingplätze aus den USA und muss schon bei deiner kurzen Beschreibung an Urlaub denken. Und ich find's toll, dass du alleine ne Party bist, hätte ich sonst direkt in die Kategorie Chuck Norris gesteckt. Zeltplatz ohne Dusche? Naja, Hauptsache ohne Bären. Apropos, das Zelt dürfte nicht "bearproof" sein. Ich bin gespannt, wann du die USA betreten wirst.